Vibrant blue colours have always made quite an impression. Widely used as energy flowers, they are also great flowers to send as a new-baby-boy gift. 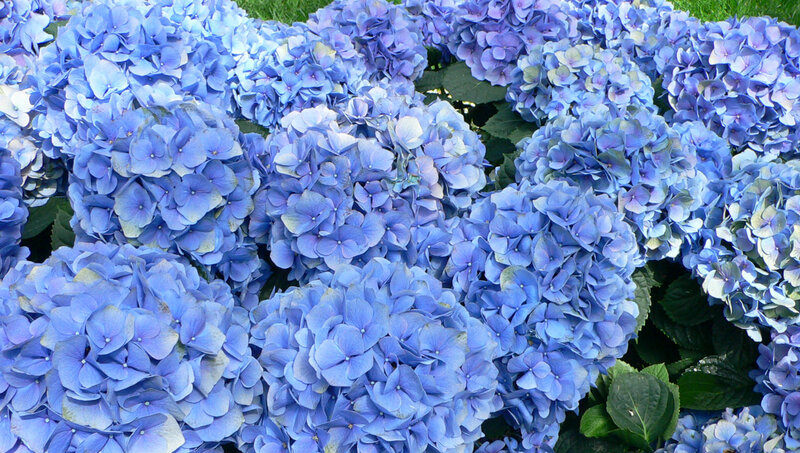 Some of the best blue flowers come in the form of hydrangeas, hyacinths, freesias and long stem iris flowers. Sending blue flowers online is certainly a popular way of welcoming a new baby boy into this world. As the colour blue represents the sky and the sea, it is also, as such, representative of flowers in a calming manner. The person who wishes to send blue flowers is usually conveying messages of peace and tranquillity. However, as it has often been the case in nature, this calm can very easily transform into more passionate forms. It has to be said that this colour is not always easily obtained and its true forms only really come with flowers like iris, hydrangea, hyacinth, agapanthus and delphinium. As such, the blue flowers are often sometimes represented by the purples and lilacs. Lately we have also seen a rise in the popularity of a blue headed rose. Don't be alarmed, due to its genetic limitations this rose is really a white rose dyed by florists. But, it does represent a significant symbol of achieving the impossible. And the person wishing to send these flowers is usually after their holy grail. If you would like us to arrange for blue roses, please make sure to call, or write to us immediately, as we do not always have these in stock and may only sometimes deliver them on our next day flower delivery system for London and the rest of UK. Send blue flowers with our same day free delivery service, if ordered by 6pm, to any London postcode and anywhere in the UK, on next day delivery, if ordered by 6pm. Our online flower selection is vast and continues to grow. However, if you find there are flowers you would like to send online that are not on the site, then why not contact us. Our shop is open 24 hours a day, seven days a week and our florist experts would be happy to help. Send hand-tied bouquets through Flower Station and you’ll know they’ll arrive fresh – with daily deliveries from our growers in Holland this is a guarantee. Order other gifts today. Our planting range is also online today – go check it out! So, whether you’re looking for a bouquet of long stem red roses, bunch of luxury pink lilies, good value flower gifts, plants in pots, or even some really cheap flowers; Flower Station has you covered. Our selection of blue themed bouquets and designs is carefully chosen with a view to seasonal availability as well as occasions. Q. Can I send blue flowers for any occasion? A. Yes, traditionally blue flowers stand for inspiration. It stands for desire, love, and the metaphysical striving for the infinite and unreachable. It symbolizes hope and the beauty of things. Most commonly blue flowers are sent to congratulate a birth of a baby boy. Q. Can I choose my own flowers and make changes to a bouquet? A. Of course you can. Should you wish to make any changes or design your own bouquet, please give our customer service team a call. Very satisfied with this company. Flowers arrived same day (Sunday) recipient is over the moon with them. They look gorgeous. Thank you very much for your prompt delivery service. Will use again. Thank you Flower Station for making sure my order for a dear friend who has just had a baby, were delivered on time. All went just as planned. Thank you.